Any way around the "I'm not a Robot"
I have likely clicked through 60 of them today alone. Life is what you make of it, even at the most difficult of times. Re: Any way around the "I'm not a Robot"
There is no way to escape the captcha verification without solving it. But by installing the extension Buster: Captcha Solver for Humans you will solve the Google reCAPTCHA quickly. 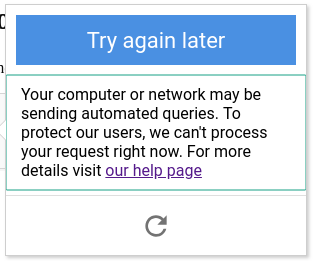 If you are facing the this error: "Your computer or network may be sending automated queries", the solution is to change your ip address. I wish that I had known about this extension 500-1,000 CAPTCHA solves ago.